(NaturalNews) The ubiquitous chemical bisphenol A (BPA), most notably found in plastic bottles and food and beverage cans, may increase blood pressure and the risk of heart disease, according to a study conducted by researchers from Seoul National University College of Medicine in South Korea and published in the journal Hypertension. "Because these results confirm findings from other studies, doctors and patients, particularly those with high blood pressure or heart disease, should be aware of the possible risks from increased blood pressure when consuming canned foods or beverages," researcher Dr. Yun-Chul Hong said. Studies have detected traces of BPA in more than 95 percent of the US population. Prior studies have associated the chemical with cardiovascular disorders, respiratory problems, neurological disorders and developmental problems in children. It has also been linked with obesity. The study was conducted on 60 volunteers from a local community center, all of them over 60 years of age. On three separate occasions, participants were randomly assigned to drink soy milk from either two glass bottles, two aluminum cans, or one can and one bottle. Two hours later, their BPA blood concentration and heart rate variability were measured. Participants abstained from any other food or drink for 8 hours before and 2 hours after drinking the soy milk. "Thanks to the crossover intervention trial design, we could control most of the potential confounders, such as population characteristics or past medical history," Hong said. Because BPA is used to line food and beverage cans, such containers are considered a major source of human exposure to the chemical. 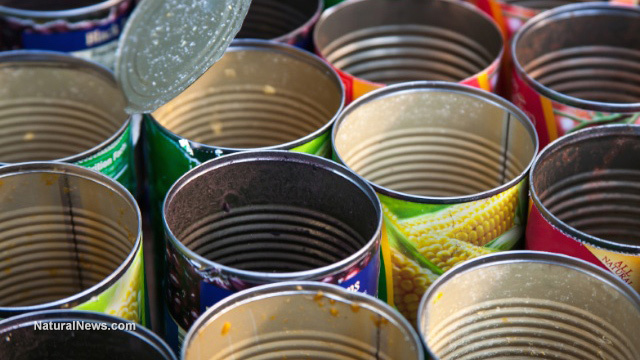 A prior study found that just five days of eating canned soup led to a 1,000 percent increase in BPA levels in urine, compared with eating soup made from fresh ingredients. The study was conducted with soy milk because studies have shown that the beverage does not raise blood pressure. The researchers found that drinking canned soy milk caused BPA concentrations to increase by as much as 1,600 percent in comparison with drinking bottled soy milk. In addition, drinking two cans of soymilk caused systolic blood pressure to rise approximately 4.5 mmHg, in comparison with the bottled drinks. "A 5 mmHg increase in systolic blood pressure by drinking two canned beverages may cause clinically significant problems, particularly in patients with heart disease or hypertension," Hong said. "A 20 mmHg increase in systolic blood pressure doubles the risk of cardiovascular disease." The findings still need to be confirmed with a larger, more long-term study, Hong said. Nevertheless, he believes that the evidence is strong enough to recommend that people avoid BPA exposure as much as possible. "I suggest consumers try to eat fresh foods or glass bottle-contained foods rather than canned foods and hopefully, manufacturers will develop and use healthy alternatives to BPA for the inner lining of can containers," he said. Another recent study, published in the journal JAMA Pediatrics in October 2014, has linked BPA exposure in the womb to later respiratory difficulties in children. The researchers found that for every 10-fold increase in maternal BPA exposure during pregnancy (measured via urine concentration), children at age four had a 14 percent decrease in respiratory status, a 55 percent increase in risk of wheezing and a 327 percent increase in the risk of persistent wheezing. Prior studies have suggested a connection between BPA exposure and respiratory problems in children, but findings have been mixed. Even in the current study, the connection between respiratory status and BPA exposure had vanished by age five. "Additional research is needed to clarify the contrasting findings in recent human studies," the researchers wrote.